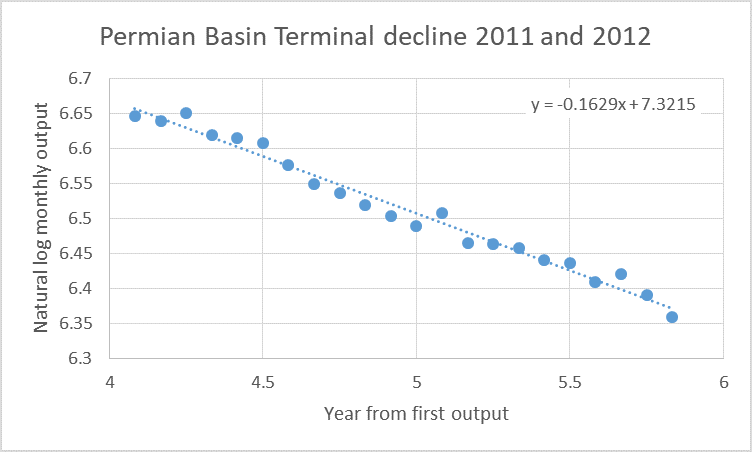 And for the final post in this series of 3: we’ll have a look at the Decline Rates in the Permian. Performance is shown of all horiz oil wells that started production between 2011 - 2014. Only wells are selected that fell below a prod rate of 60 bo/d, not later than May 2016 (ensuring at least 30 months of data for all wells). We count 3,183 such wells, from in total 6,065 horiz oil wells that started in the Permian in these 4 years. The top chart shows oil production rate (log scale), by the number of months since they fell below 60 bo/d. The bottom chart shows the average annual decline, based on the plot above. Terminal decline rates are lower here than in the DJ Basin & the Eagle Ford. The decline rates drop to a level between 15 and 25%, before they stabilize or start to increase again. As noted above, data after 30 months is not complete (not all wells have more historical data). Also here you’ll see that younger wells experience larger decline rates. Again we should emphasize that is partially expected, as they are earlier in their hyperbolic decline curve, where decline rates are naturally higher. But it still appears that even if you correct for that, younger wells decline faster. Enno, thanks for sharing and your work. It probably depends on the company. My goal has been to make it very easy to compare stated EURs, with what the actual data suggests might be possible, and I think the above plot is pretty good for that. Just select the operator & area that you want to verify, choose the economic limit that you think is reasonable, and estimate the potential EUR range at that limit. Just make sure to also look at the gas stream, as this often represents a big portion of the EUR. Khekhe... gas and LPG won't be very useful at making diesel or even gasoline. 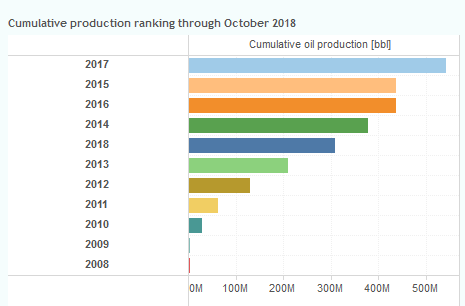 Thanks, I didn't realize EURs in "Cumulative Production Ranking" are companies dreams and not the actual projections. From my experience those are going to be the worst performing wells drilled. It wasn't until 2014 that Cimarex discovered that drilling north south and using slick water fracs produced much better production. I am not sure about the decline rates of the newer vs older wells but I would not put a lot of faith in these numbers based on my own experience. The older fracs used a lot of gel which tended to remain in the pores and not flush as well. This resulted in greater declines early in the life of the wells. I am surprised there are that many wells out there, they may not have been in the Wolfcamp either. That is where the most new production is coming from currently. A lot of the earlier wells were in the Bone Springs which isn't as productive in Texas but is doing well in New Mexico. However, the production from New Mexico didn't start until 2015 or so. Most wells drilled back then were experimental. Interference is something they are working on right now. I have spoken to several operators out there on some of my sections. There are obvious communication effects from as far as 1/2 mile away when a frac is occurring. There have been stuck drill bits due to this. The biggest issue when drilling another well is how it relieves formation pressure of existing wells. Right now they feel comfortable that 1300 feet is good enough horizontal spacing so that each well only drains it's part of the formation. The vertical extent of the frack is about 50-75 feet and the horizontal is likely to be as much as 300 feet on each side. The trick is to not have the fractures connect and thus one well simply drains another. That is where you lose the full benefit of the infill well. The wine rack spacing is what I think Chevron is having success with. In that kind of arrangement the spacing can be as close as 660 feet but on the diagonal you have about 737 feet between the horizontals. That is the wells are spaced at 1300 feet on the horizontal for each horizon but the next horizon is drilled offset by 660ft on the horizontal and 330 on the vertical. This maintains a 1300 ft horizontal spacing on each horizon with the horizons separated vertically by 330 feet. This is why it's called wine rack spacing. Sounds a good technique but if "younger wells decline faster" either they are drilled in less productive zones or depleted zones. No evidence he presents is using wells produced since 2014 and that is when they started becoming productive. Before that it was just one big experiment. He should start over and analyze wells from 2014 through 2018. > Thanks, I didn't realize EURs in "Cumulative Production Ranking" are companies dreams and not the actual projections. This overview shows the realized cumulative production from wells in the selected category. For example, if you group the wells by vintage (like in the above screenshot), it will give you the total cumulative production from all the wells that started in a year, e.g. over 500 million bbl for wells that started in 2017. 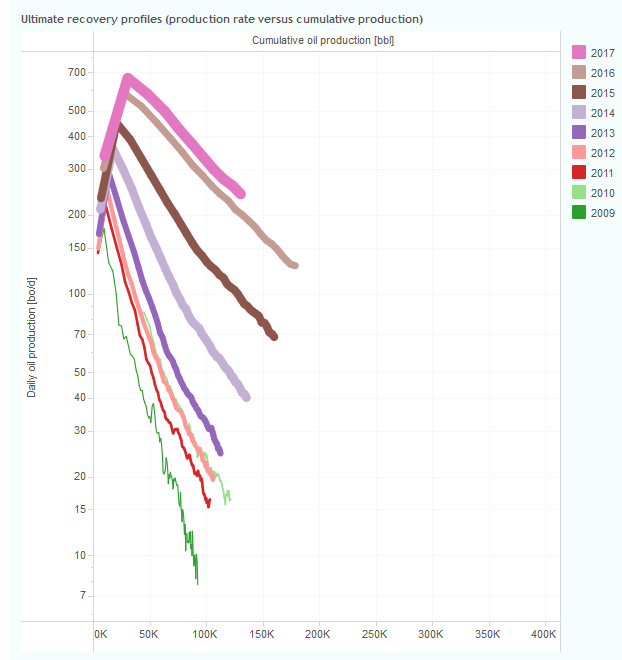 You can also group them by well (in the interactive version on our site), which will rank the realized cumulative production for each individual well.